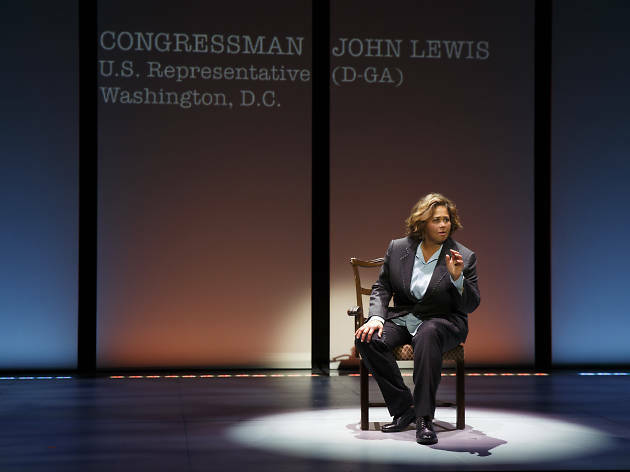 In her latest documentary solo play, the audacious and mind-opening Notes from the Field, Anna Deavere Smith delves into poverty, police brutality, mass incarceration and educational failure. Yet even as she shifts, with almost insouciant skill, among 17 characters of different sexes and races, she never disappears. The play’s monologues are based on interviews Smith conducted—which gives them a rare naturalness of speech—and her probing intelligence and fair-mindedness retain a tangible presence, assembling the monologues like puzzle pieces to form a larger picture. That picture is often bleak. 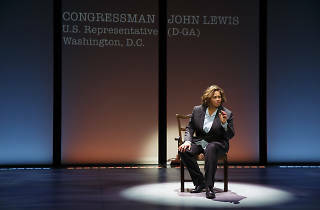 In Leonard Foglia’s effective staging, Smith’s riveting performance is augmented with photos and video of recent incidents of racial disharmony. The roots of this crisis go deep, as she illuminates through the words of people ranging from eloquent NAACP Legal Defense Fund president Sherrilyn Ifill and impassioned preacher Jamal-Harrison Bryant to a halting, heartbreaking prisoner named Denise Dodson. But while those trapped in the school-to-prison pipeline Smith explores may see their own cases as hopeless, the playwright-performer holds out for the possibility of positive change through a combination of compassion, resources and discipline. She holds her subjects in a tough but loving embrace. Second Stage Theatre (Off Broadway). By Anna Deavere Smith. Directed by Leonard Foglia. With Smith. Running time: 2hrs 15mins. Through Dec 11. Click here for full ticket and venue information.